I am not sure if you are familiar with Lego ideas? Basically, it’s a way to get your very own Lego set design made in real life. All you have to do is create a model of what ever you want to become a set. (Haha, I say all, but it does sound quite difficult.) The next thing is to gather support. Once you’ve hit ten thousand supporters, Lego will automatically review your idea. This is the scary part because Lego will put your idea in front of a board of set designers and marketers. If all goes well however, then Lego will tweek the design, maybe add in some extra bits and bobs and then BAM, your idea is on the shelves at your nearest ToysRUs. Why am I telling you all about Lego ideas? 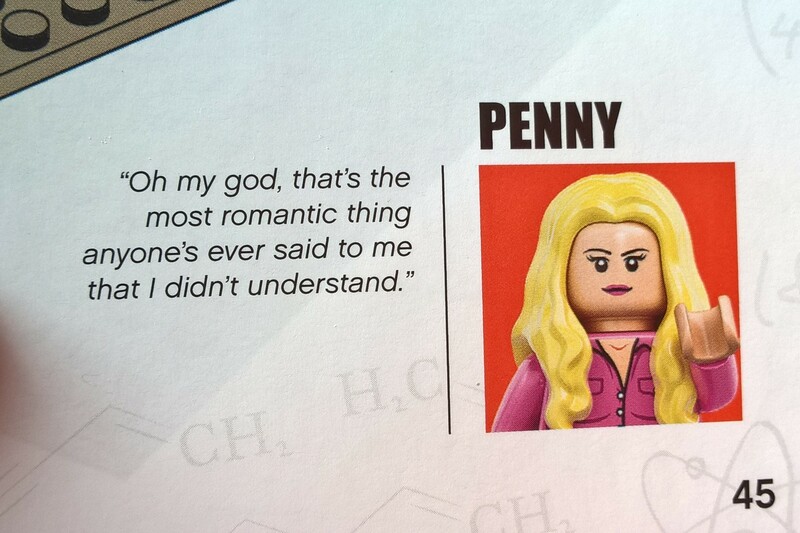 I mean, come on what does it have to do with The Big Bang Theory Lego set? Well, it just so happens that this is how it got made. So now I have given you a fun paragraph full of fun Lego facts, lets get on with the review! At first glance the set looks awfully small. Lego had packaged the set into quite a large box and so when I opened the parcel to find that the set only took up a small percentage of the box, I was a little disappointed. I wasn’t down on my knees yelling “why Lego, why?” or anything dramatic like that because the sets recommended retail price is only £49.99. Although that seems like a lot of money, a lot of effort goes into scaling each model down. Once the set is assembled, it looks quite impressive and in hindsight, I think that the cost of the set is pretty reasonable. I guess it wouldn’t have hurt to have free delivery though. The set is very similar, if not identical to Leonard’s and Sheldon’s front room on the show. Like the show, the iconic brown sofa is in the middle of the room with the lamp on the table next to Sheldon’s spot. The D NA model in the corner and there is even the white board attached to the wall behind it. 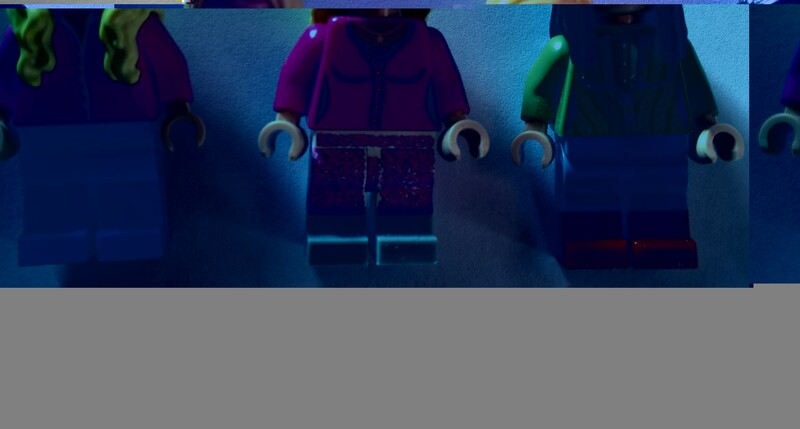 There is even little Chinese food boxes which can be positioned on the table or into the Minifigures hands. One thing which lets the set down is that on the door behind the sofa there is a strange looking decal. I am assuming the decal is meant to look like the boxing poster (like in the show.) However, because the sticker only shows an empty ring, whereas in the show there are people in it, it is hard to figure out what it is meant to be. A part of me thought it was a door vent until I googled it and found out that I was so so wrong. Overall though I would give the set eight out of ten for design. The set comes with all the character Minifigures. 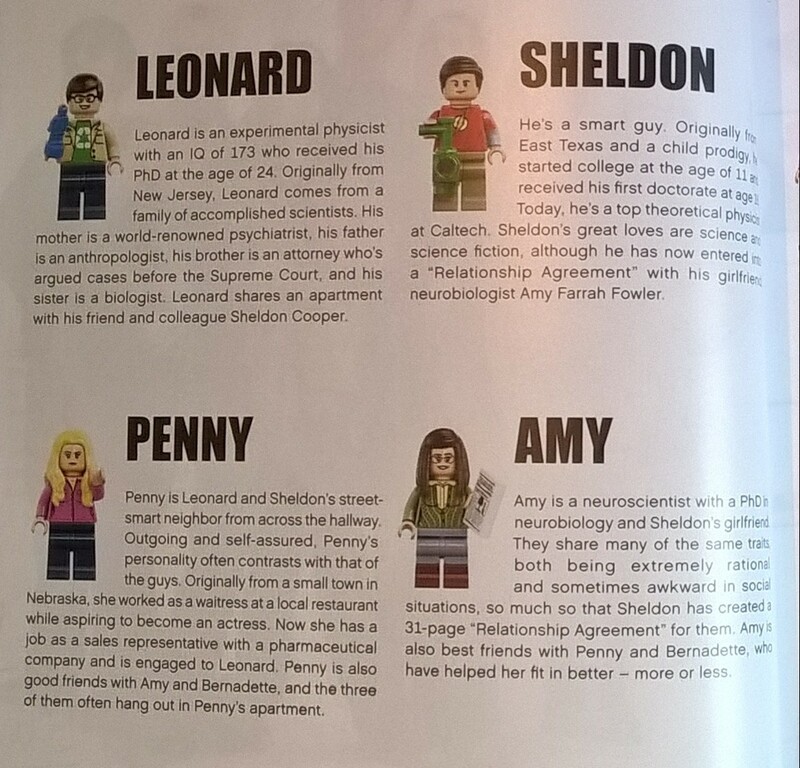 We have a little Lego Leonard, a Lego Sheldon, a Lego Howard, a Raj, a Penny, a Bernadette and an Amy. What is even more amazing is not only are all the characters included but also Cinnamon is. Awwwww. I like how they have included all the characters because it would have been so easy to put them into a different future set or add them into a Lego Minifigure series. 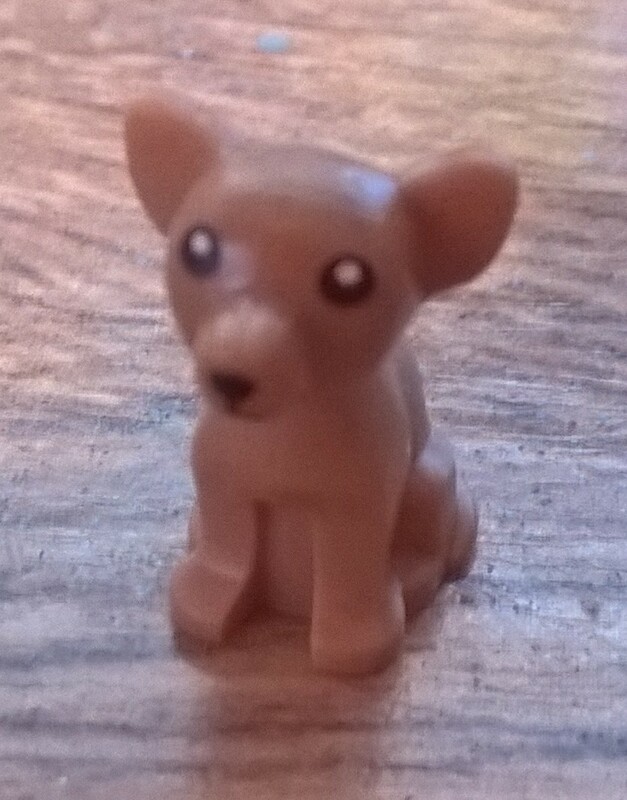 I am still trying to collect all the Harry Potter Lego figures and some of them are near impossible to get hold of or cost big bucks because they are only available in Lego sets. On the down side some of the characters don’t quite look the way they do in the show. For instance, Bernadette and Penny look a little strange. Bernadette always wheres dresses so why is she wearing pink trousers? Is that meant to be a dress? I have no idea. Also, I got confused when assembling the Minifigures because Amy’s and Bernadette’s faces look almost identical. Hmm, perhaps you could have made the glasses a lot more obvious or something? I can’t complain too much though, because when all the characters are together it is easy to tell who is who. Lastly, the quality of the instruction booklet is of a really high standard. The instruction booklets which came with the Simpsons house and the Kwik-E-Mart were just pieces of paper stabled together to create a book. Pages would easily fall out and the sheets were quite thin. This is quite annoying as I like keep the instructions for future reference because lets face it, I am super clumsy and there is a big chance that I will drop the set. (It has happened many times before.) Whereas all my other instruction booklets are all battered or a large pile of random pages, I can pop this one onto my book shelf, where it blends in nicely with all my other books. What I also liked about the booklet is that the first few pages act as an introduction to the show. There are even character profiles with pictures of the characters in their Lego Minifigure form. As you begin to assemble the set every now and then you come across a quote at the bottom of the page. This booklet is a pretty fancy instruction booklet. Overall, I love this Lego set. Do I love it as much as the Simpsons sets? No, but that is unfair because the Simpsons is one of my all time favorite TV shows. I like how Lego have released a set which is obviously not just for kids. 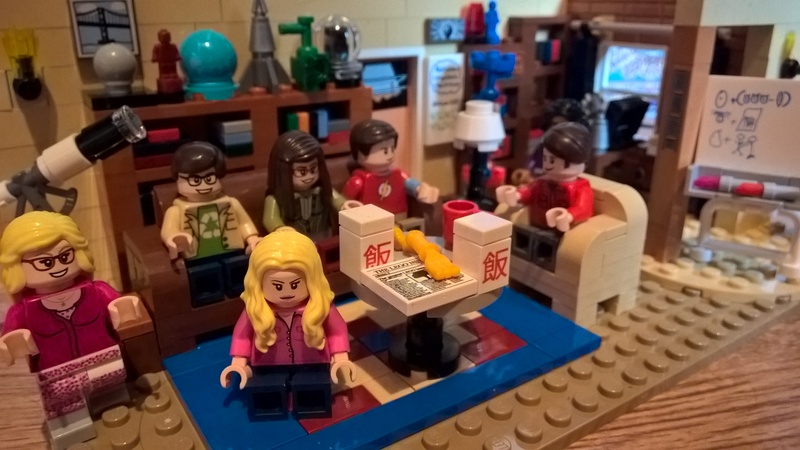 Will this set be the benchmark for a few more The Big Bang Theory Lego sets? I would like to say yes, but I have a feeling there won’t be anymore. Personally, I would like to see the rest of the apartment, Penny’s flat and also Stewart’s comic book shop. But for now, this is a nice little set which doesn’t take up too much room. The Minifigures alone make this set a worth while purchase.